This morning Mickey left part of the newspaper out on the table for me to look at but I'd looked at it before he said anything. I don't usually read the paper but this morning there was something that caught my eye. It was a picture of a red-headed boy that looks a lot like our red-headed boy. I had to do a double take. It wasn't Kade but the resemblance was there. 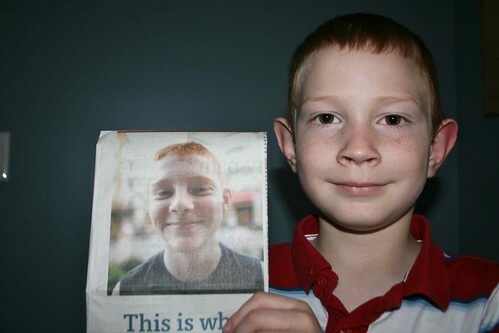 When I put the picture next to Kade the similarities seemed to fade some and the boy in the ad is a little older. But can you see why I would do a double take? So true! But Kade is much cuter. Oh, we miss that cute Kade! Mimi was just talking about him.